Kashmir is an 80% Indica dominant hybrid that is a cross between Vanilla Kush and Purple Pig. It has a relatively high THC content ranging between 19-23% on average. Though Indica dominant the cerebral head high is quite potent from the onset and induces moderate euphoria and an energetic buzz initially. This head buzz gradually fades away due to the Indica body effects. Kashmir is said to gain in potency as time goes by, and the high lasts for around 2 hours. Kashmir has an appropriate balance between Indica and Sativa that is much sought after by both recreational and medical users. Kashmir has an earthy lemon smell with a hint of peppery vanilla and a taste that is just as sweet with a fresh minty vanilla aftertaste. This dank bud has spade-shaped, dense olive-green buds that are laden with crystals and practically dripping with sugary sweet resin. Kashmir looks and tastes very much like hash. This is a popular and well-known strain that will certainly induce couch lock. It is best used for a recreational evening either alone or with friends, ideal for listening to music or watching a movie. Kashmir is not an active strain of marijuana and if there is a need to perform functional tasks then other strains are more appropriate. The smell of Kashmir is sublime, hard to describe but not a typical marijuana strain. However, the hashy taste has a scent that can make users choke on the exhale. Kashmir is relatively common on the recreational and medical market and is easy to come by for both patients and recreational users. Kashmir has a short flowering time and high yields but is somewhat difficult to grow. Why do Patients Use Kashmir? Kashmir is a versatile and well-balanced strain of marijuana with a variety of uses. It is effective for the treatment of anxiety, depression, stress, mild to moderate pain, insomnia, glaucoma and eating disorders. Strains that are in the region of 70 to 80 percent Indica dominant tend to have the perfect balance of Indica to Sativa effects making them effective in the treatment of the widest variety of conditions. This strain is best used in the evening and the only medical area where it fails to triumph is psychosomatic conditions and cases of extreme pain. Kashmir is widely available in medical dispensaries in Oregon, California, Washington and Colorado. Kashmir is a cross between Vanilla Kush and Purple Pig. Kashmir has a rating of 8.4 on the stoned meter. The breeder of Kashmir is unknown. Flowering time of Kashmir is between 6-8 weeks. Kashmir is best grown indoors in a Sea of Green soil setup. Kashmir is a plant that grows between 3-5 feet. Kashmir generates a high yield, around 400-600 grams indoors. 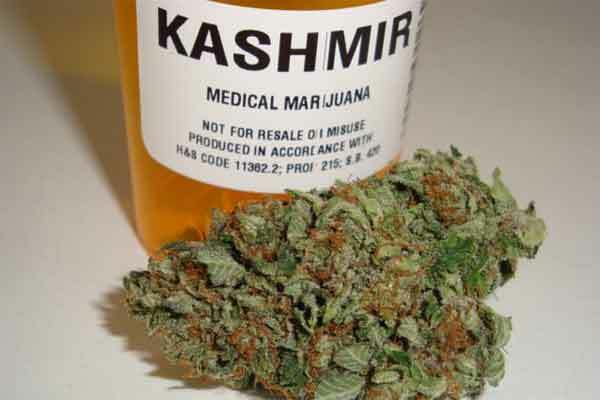 Kashmir is a strain that requires moderate growing experience. Kashmir does need a lot of light and nutrients to generate good yields. It is also quite susceptible to pests and mold.